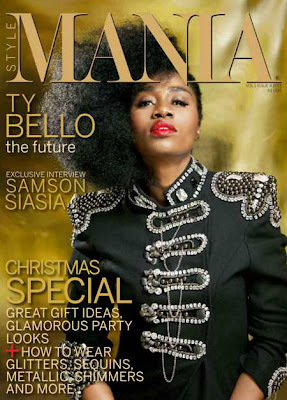 The special Christmas edition of StyleMania Magazine to hit the newsstands soon features TY Bello; the ace photographer and musician. This edition also features an exclusive interview with Samson Siasia, Omoyemi Akerele, Bez, Azuka Ogujiuba, Peju Alatise and an incisive history of the Nigerian fashion industry; catch an eyeful of great gift ideas and glamorous party looks. For further enquires, subscription, advertising and back issue, call: 07058109821 or 08025954648 write to editor@maniamag.org. I love StyleMania Magazine and for my TY Bello on the cover page, i must surely grab a copy. TY rocks!!!! Not a flatterin picture. Sorry i aint feeling it. TY!!!!! (That's me screaming in joy)..I'm SO getting myself a copy. her eyebrows need to go. makes her look unkept. seriously just shut up if you have something negative to say ! jump off a bridge !! This womans hair is DIVINE !! natural beauty !! has no horse tail or dead womans hair sown to her hair ! Wooooww!TY DAT SUIT SURE LUKS GREAT ON U.UR HAIR IS AWESOME N UNIQUE TOO. Jst luv ur unique sense of style. I love ano nymous 8:36 "she is TY Bello and you are.....?" thats a question for all you who hate for the wrong reasons. Imagine some1 just said her eyebrows have to go! Go and check that person has not made her hair in the last 6 months...(come here just talk sha make them for say you talk).....Ehis say so! It's not her hair. She came out a while ago to say she buys Sleek Afro introduced to her by Ify Ugochukwu. She's Mrs T.Y Bello. Her maiden name is Sokefun so why the lesbian talk? She's definitely looked better in other pictures. Actress Fathia Balogun's New Look!